Microsoft continues to draw inspiration from Mozilla. Earlier, it were the Mozilla's Orange Icons that later became the official feed icons for Windows Vista and Office 2007. Now, close on heals of Mozilla Bugzilla, a public bug-tracking database, Microsoft launched the Internet Explorer Feedback Web site, a public database that enables users to submit bugs and make suggestions IE. 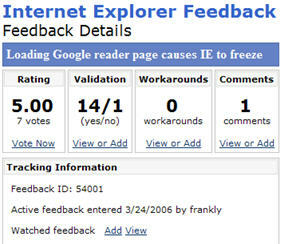 The Microsoft Bugzilla will be used for IE7 and all future releases. A Passport account is required, but a forthcoming update to the site will enable anyone to view existing bugs without logging in. The effort is a shift in policy for Microsoft, which has long kept bug information restricted from the public eye. Now, anyone will be able to see the number of outstanding problems with Internet Explorer, and even potentially security vulnerabilities.